Maybe it’s the pretty colors, or perhaps just its reliable presence at the farmer’s market, but I am consistently drawn to swiss chard. I love its texture and depth of flavor, and the way it always feels a little more unexpected than, say, spinach or kale. (Of course take a quick scroll through my recipe index and you can see very clearly that I have major love for those two as well.) 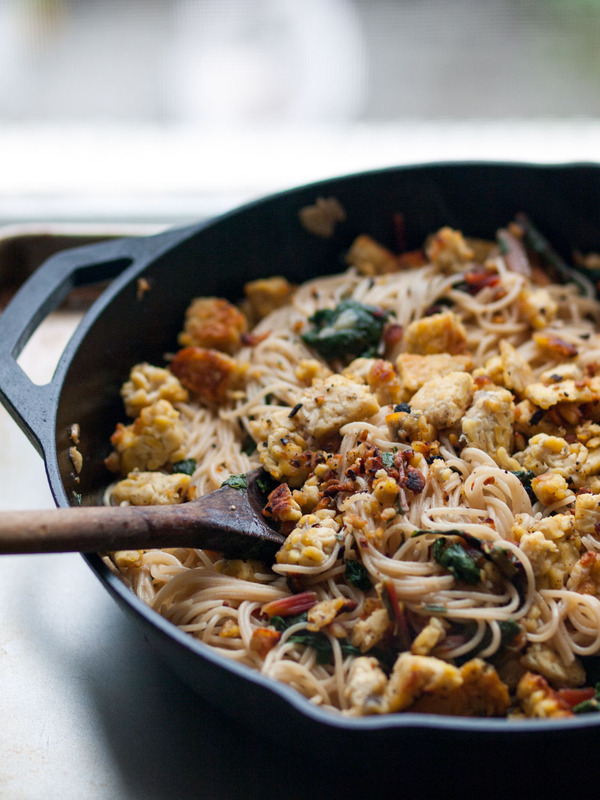 Here I’ve combined chard with spaghetti and golden pan-fried tempeh to make a dish that’s earthy, garlicky, and straight up delicious. Just thinking about it makes me hungry. First, steam your tempeh. Place tempeh in a bowl with about an inch of water, cover, and microwave on high for 5 minutes. Alternatively, place in a saucepan and cover with water. Cook over high heat until boiling, then cover with lid, reduce heat, and simmer for 10 minutes. Drain and pat dry. Drizzle some olive oil in a large skillet and heat over medium. When hot, add tempeh and season with garlic powder, salt, and a pinch of red pepper flakes. Use a wooden spoon to mix and break up the pieces of tempeh. You’re going for crumbly here. Then let cook, without touching for about 3 minutes, til it starts to get golden. Warning: you may want to use a splatter guard here (or a lid tilted on its side). Stir/turn pieces over, and cook for another 3 minutes or so. 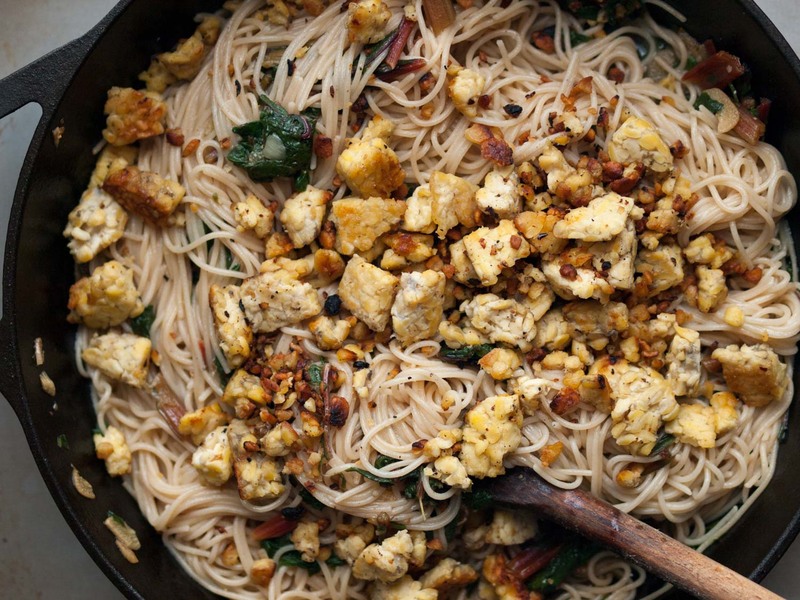 Remove tempeh from skillet and set aside. Meanwhile, cook pasta in salted water according to package directions. If it finishes before everything else is ready, toss the drained pasta with a bit of olive oil to keep from sticking. Drizzle some more olive oil into the skillet and add garlic and a pinch of red pepper flakes. Cook over medium-low for about 3 minutes, or until fragrant. 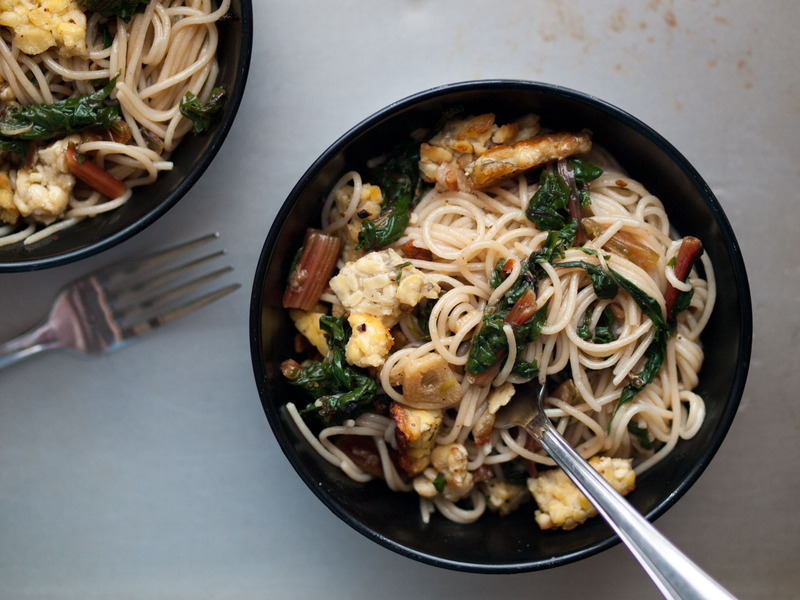 Stir in chopped chard stems and ½ cup of vegetable broth. Cover, turn up head to medium-high, and cook for about 3 minutes. 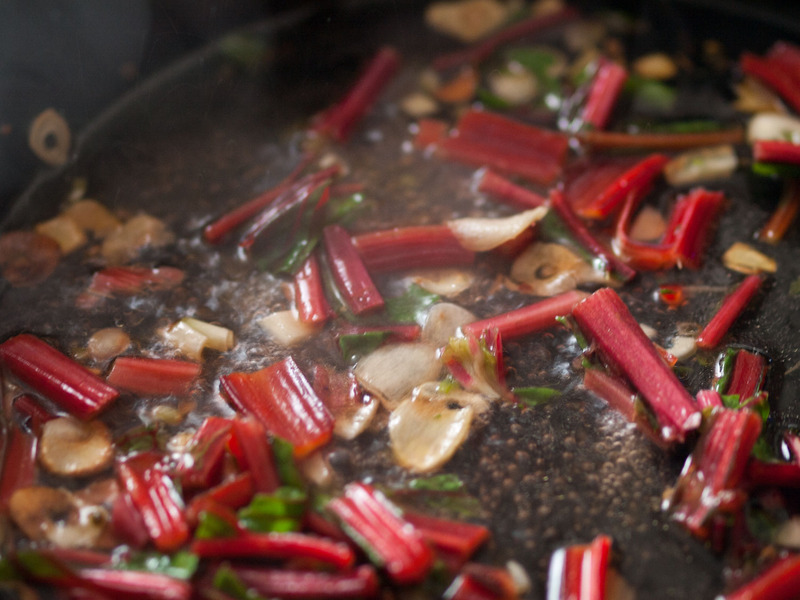 Add the chard leaves and remaining ½ cup vegetable broth and cook, covered, stirring occasionally, for 5-6 minutes or until cooked through. Add the pasta to the chard mixture, sprinkle on the tempeh, drizzle with a little more olive oil, season with salt and pepper to taste, and mix everything together. Serve. This entry was posted in Mains and tagged gluten-free, vegan on July 16, 2018 by Sarah.